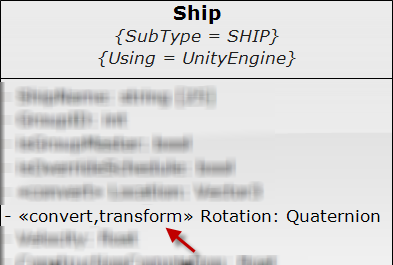 Whenever the attribute uses the stereotype "convert", we generate a converter. Your job is to convert the field into a string field so that it can be stored in the database, and provide a converter back from a string into the internal type. 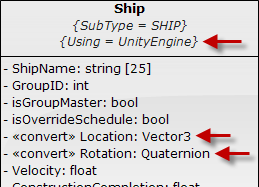 The code shown above shows how to convert a Vector2, Vector3 and Quaternion to and from a string. When the string is defined in the table, it's given an unlimited size, so any string up to 1Gb can be used. This allows the class domain to reference the full type while saving the data as a string. We also added "Using" tagged values so that the proper using statements are generated for the extra types you may want to define. /// Angle the ship is pointed. When the attribute contains the "transform" stereotype, this code is not generated, and it becomes the responsibility of the Developer to create their own transformation in their implementation of the partial class.